An in depth look at the sustainable materials in restrooms and locker rooms. Explanation of how High Density Polyethylene (HDPE) reduces environmental impact and ways it offers both initial and long term improvements to the indoor air quality of any project. Several examples of how responsible manufacturing is a critical part of any products life cycle assessment. Date: Tuesday, March 29, 2016. The program will begin with a one-hour tour lead by the 4 panelists and their design team. The tour will showcase the renovated spaces, the new grand entrance and lobby, a new contemporary artwork gallery space, and a 142-seat cinema with advanced technology. After the tour, there will be a networking cocktail hour with drinks and heavy hors d'oeuvres. At 6pm, the panelists will convene in the new theater to discuss design strategies, material & finish selections, and construction complexities. This is a unique opportunity for the professional design community to come together to experience and learn about this remarkable project. You don't want to miss it! Parking: Hourly parking is available in the parking garage adjacent to the Speed on South Third Street. On-street metered parking is also available. Operating hours for meters are Monday - Saturday, 7 a.m. to 6 p.m. Parking at metered spaces is free after 6 p.m.
Space is limited so please register as soon as possible. Date/Time: Tuesday, April 19, 2016. Doors open at 5:30pm, the lecture will begin promptly at 6:00pm and end at approximately 7:00pm. Registration: Please see the following link to register for the event: https://flwkentuckylecture-aiackc.eventbrite.com or email atriplett@jrarchitects.com. Presentation: Frank Lloyd Wright is America's most recognized architect. While he designed hundreds projects around the nation, he had very limited commissions within Kentucky. Only one built project is directly linked to him in the state, and he had just one well-publicized visit to Louisville. His influence though goes beyond these two physical connections. Many of his protégés as well as his successor firm (Taliesin) implemented several projects here. Date/Time: Tuesday, May 17, 2016 at 11:45. Registration: Please see the following link to register for the event: Eventbrite or email atriplett@jrarchitects.com. 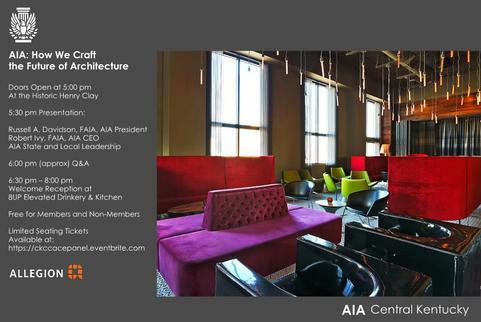 Fee: Free for AIA members, $20 for non-members. Valerie Magnuson is the Director of Louisville Grows, a non-profit working to grow a just and sustainable community through urban agriculture, urban forestry, and environmental education. Valerie will present an overview of the Love Louisville Trees program and it's engagement of 'Citizen Foresters' to reforest our urban neighborhoods. For those coming up on Friday, dinner to be at a restaurant in Berea. Details will be forthcoming soon. 8:30am - Registration and continental breakfast. Each seminar will be worth: 1.0 AIA HSW LU & 1.0 GBCI LEED specific credit (3 total). Lunch will be from noon to 1:00. All programming (seminars and meals) up to this point will be held at Boone Tavern. The afternoon programming will be a walking tour of several buildings on the Berea College Campus. 6:30pm - Dinner at Boone Tavern. Program following dinner TBA. It could be a movie or we may just socialize with drinks. Total AIA & GBCI CEUs for the day: 6.5 (all HSW). Click here for detailed information about the programs and speakers. Cost for entire day is $40 for AIA members and guests, $60 for non members. A block of rooms has been reserved for conference attendees and reservations can be made directly with the Lodge. 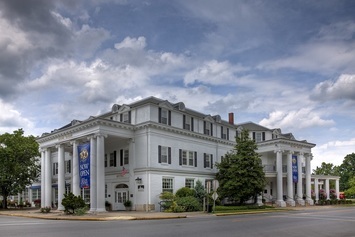 To make reservations, contact the hotel directly by phone at 859-985-3700. Special rates end May 27th! J. Harrods Restaurant & Bar, 7507 River Rd, Prospect, KY followed by Tour. Meet on Transylvania Beach where bridge passes overhead. Thursday, June 23, 2016 at 5:30pm. 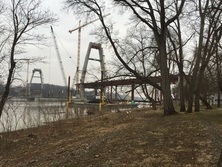 The bridges project has now been under construction of several years. The downtown bridge, now named the Lincoln Bridge is complete. The Kennedy Bridge is being redecked and Spaghetti Junction and the bridge approaches are being reconfigured. Everyone who works downtown has been watching its progress. Meanwhile in the east, the work on the east end bridge, its approaches, and the tunnel are also making significant progress, however this work is mostly out of sight. Join us for a PowerPoint presentation of the bridges project followed by a tour of the east end bridge. Robert Morphonios, the CEO and Project Director for WVB East End Partners, LLC, representing a consortium of Public Private Partnership (P3) Developers consisting of Walsh, VINCI and BBGI will make the presentation. After dinner and the presentation, as a group, we will then drive over to Transylvania Beach to see the east end bridge up close. Depending on the level of construction activity at the time, we are hoping to be able to walk along the trestle leading to the bridge tower. If we are unable to access the site, Mr Morphonios will describe the work form the driveway of a residents immediately adjacent to the bridge crossing. Assuming we are able to access the site, all visitors will be required to wear personal protection equipment ( Hard Hat, Class II Traffic Vest, ANSI rate safety glasses, and over the ankle construction boots....no exceptions). Please bring your own equipment. Mr. Morphonios will provide a quick safety briefing before going on site. Free for AIA members, $20 for non-members. Date/Time: Thursday, July 19, 2016 at 5:30pm. The project is the first expansion for the Filson Historical Society on its current site located within 'Old Louisville', the historic neighborhood first developed during the late 1800's after the Southern Exposition. The project includes multiple components: a new 20,000 s.f. 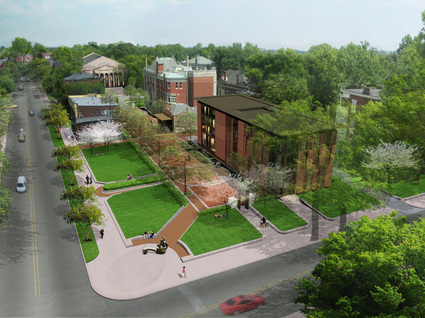 building addition, renovation of the existing Ferguson Mansion and its adjacent carriage house, and a new outdoor quad that is accessible for the entire community. Programmatically, the new building will double the Filson's archival storage capacity and provide a new oration-quality lecture hall, as well as providing flexible-use event spaces that will incorporate changing exhibits. For more information about the project, Click Here to visit the de Leon & Primmer Architecture Workshop website. Attendees will convene at the lobby of the New Addition located on the Filson Historical Society campus at 1310 South Third Street. Refreshments will be served in the lecture hall off of the lobby before the building tour begins at (time). Attendees will tour the renovated Mansion, Carriage House and New Addition with the Architects from de Leon & Primmer Architecture Workshop. Following the tour and a short Q&A, a special reception will be held to acknowledge Roberto de Leon's acceptance into the American Institute of Architects College of Fellows. Registration: To be set up. FREE FOR AIA MEMBERS AND NON-MEMBERS. LIMITED SEATING. The health of our industry is contigent upon a complex range of factors, from economics to education. Architects shape the trajectory of our industry with each client and community served. Together with the AIA, we can build a brighter future as we strive to enrich the lives of those we serve through the practice of architecture. Let's show AIA National our Southern hospitality! Join us after the panel discussion at 8UP for a cocktail reception with our guests. Attendees are welcome to enjoy appetizers. Drink tickets will be provided followed by a cash bar. Click Here to see facebook Link. Click here for to download the flyer. Location: 1019 East Utica Street, Sellersburg, IN. 5:45 PM: Refreshments, Welcome and history of the facility. 6:30 PM: Tour Construction Material Lab, (CML) Mix Design Lab for Asphalt, Concrete and Aggregate. 7:00 PM: Return to Shelter House for Questions and Summary. Irving Materials Group Group of Companies operates 20 limestone quarries in Indiana, 19 Asphalt Plants, Indiana, (E&B Paving) and 160 Ready Mix Plants in Indiana, Kentucky and Tennessee. Imi Sellersburg Stone is the largest limestone Quarry in this region. Our plant produces over 800 ton per hour. The pit is 200' deep, we produce from 5 formations, 3 class A ledges. We produce construction aggregate for concrete, asphalt production. Our CMI Drum mix plant, produces over 500 ton per hour. Largest asphalt plant in the region. Production will be over 400,000 ton this season. Construction Materials Laboratory, (CML) is an ASHTO Approved Lab. CML develops mix designs for Concrete and Asphalt as well as Aggregate Quality Control. INDOT, KYDOT and FAA mix designs are the majority of our work. Date/Time: Wednesday, October 19th from 11:45 to 1:00. For many years the AIA, and the rest of the construction industry, has included arbitration as the preferred means to resolve legal disputes arising in the construction process. At one time, arbitration was a fairly informal process (parties often participated without attorneys), but over the years it has increased in complexity and expense. The Architect's role in the arbitration process has also become more complex, creating potential conflicts and liability. This seminar is intended to review what the Architect can expect in the arbitration process, and explore some potential traps and how to avoid them or mitigate their effects. Discuss the role that arbitration plays in the construction process. Familiarize attendees with arbitration procedure under standard AIA contract clauses and American Arbitration Association rules. Understand the issues unique to Architects while participating in arbitration. Explain how an Architect may become an AAA arbitrator, and what to expect. About the Presenter: Margie Lynn Loeser, Esq. is an attorney in private practice. Ms Loeser has served as an arbitrator in numerous construction disputes, and is a construction, commercial, and large/complex case panel member of the American Arbitration Association. Practice Concentration: Civil litigation and construction law. Construction Law Experience: Complex construction, environmental, and commercial litigation in both federal and state courts, and has served as counsel for the City of Louisville. Prior to beginning the practice of law, Ms Loeser was an architectural project manager for several private architecture firms and a construction contract administrator for the City of Louisville. She served as a member of the American Bar Association's Forum Committee on the Construction Industry Division Steering Committee and the Commonwealth of Kentucky Architect Selection Committee. She has also served as a resource member of the American Institute of Architects Documents Committee. Date/Time: Tuesday, November 15th from 11:45 to 1:00. Cost: Free to AIA members, $20 for non-AIA members. Bill Weyland will discuss the project and the history of the building. Ashlyn Ackerman will lead a building tour afterwards. Located at the corner of 7th and Ormsby streets, the Edison Center is a prominent building, built in 1924 as a LG&E operations center to consolidate all field employees under one roof. LG&E operated on the site for over 50 years until it outgrew the facility. Vacant since the late 1990s, the 120,000 square foot main building has been transformed into modern, open-plan office space. 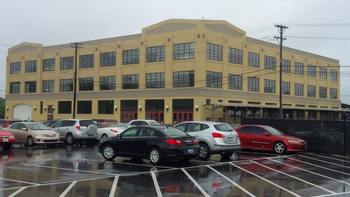 Over the past several months, 300 Louisville Metro employees, including Community Services and the Air Pollution Control District, have moved into the renovated facility. The Edison Center is named after Thomas Edison. Edison premiered his electric lightbulb at the Southern Exposition, a World's Fair type of event that lasted from 1883-1887, in the area of Old Louisville that is now St. James Court and Central Park. The Edison Center is located less than a mile from the site of the Southern Exposition. One of the four original fountains from the Southern Exposition is being restored and will be installed near the entrance to the building. In addition, a historic display in the lobby will celebrate the history of the Southern Exposition as well as the operations of the Louisville Gas & Electric Company on the site. The project was developed by Weyland Ventures. Joseph and Joseph Architects, Kerr-Greulich Engineers, Inc., and Land Design & Development, Inc. provided design and engineering services. BosseMattingly Constructors is serving as the general contractor on the project. The Annual meeting will take place at the beginning of the program. See article below for slate of officers and directors. Parking: Parking will be available across the street at the parking garage. You and a guest are invited to join us on December 15th for the annual AIA/CSI Louisville Holiday Party. Join us at the Ice House for dinner and drinks. The cash bar will open at 6:30pm. Dinner is served at 7:30pm. The evening will conclude by 9:30pm. This is a FREE event for AIA/CKC and CSI Louisville members and their guests. Member spouses and significant others are welcomed to attend this event. We look forward to seeing you there! Sponsorship opportunites are still available. If you would like to be a support sponsor ($100), please follow the link below. As a Support Sponsor, you will have your company logo listed on signage at each table, your logo will appear on a Projector Slide Show and Digital Kiosk, and you will receive website recognition. Click Here for a Sponsorship. We thank you for your support, and we look forward to seeing you at our AIA/CSI Holiday Party on Thursday, December 15th.